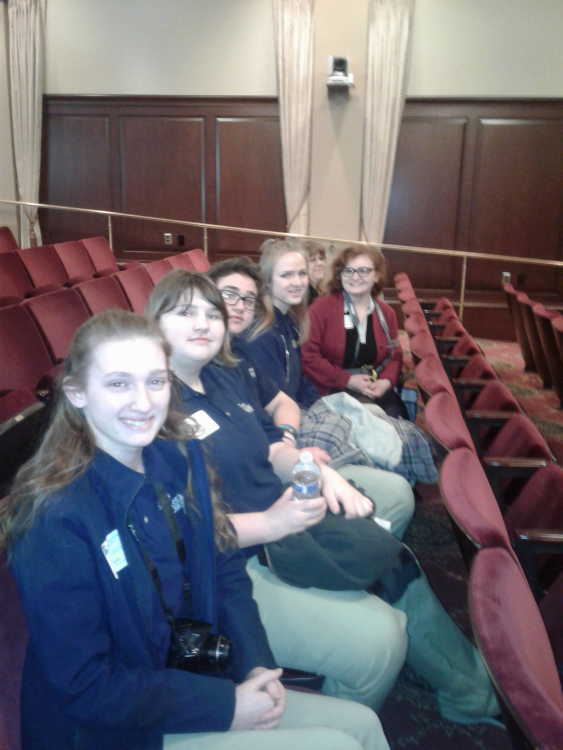 Richard McKenna Charter High School students at the State House for Idaho Day. Front to back: Constance Sullivan, Jessica LeClair, Andrew Ruhter and Caitlyn Murphy and teacher Calista Houdek, who teaches the American Wars class at RMCHS. On Monday, March 4, “Idaho Day” was celebrated throughout the state, starting at the state capitol in Boise where the 2019 theme of “My Town Idaho” was feted with a proclamation read and signed by Governor Brad Little, speeches, fanfare and a chorale of children from Roosevelt Elementary’s fourth grade class. The main program took place in the Lincoln Auditorium in the statehouse,where the VIP seating held “My Town Idaho” representatives from the City of Mountain Home.For the full story, pick up a copy of the Mountain Home News or click on this link to subscribe to the newspaper's online edition.